With Glittering Eyes: A 'little dream' come true. A 'little dream' come true. So... remember way back in January? When I wrote a post about little summer dreams that I have? 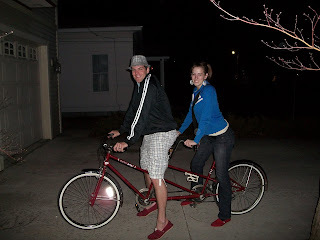 Well, one of those little dreams involved a tandem bicycle. I have had a dream ever since then of acquiring one and riding around small towns in Michigan all summer; eating ice cream and laughing with my love. Well, GUESS WHAT! One of my little dreams came true! Josh surprised me last night when he picked me up for our date and informed me that we would be driving to Grand Rapids to pick up my a tandem bicycle! Oh goodness, she is such a beauty. I was seriously giddy the whole way there mixed with moments of calm probing like, "so are you SURE you want to get one? 'Cause i mean... it's ok if we don't..." followed by another little celebration of more bouncing around in the seat next to him. Our Toms shoes even match! We rode all over town, went to McDonalds, did a drive by of a couple of our friends houses and then back to store it at my parents for the evening. Fortunately, Brad was awake to snag this picture of us. Seriously, we were both smiling and laughing the whole time. My cheeks were actually starting to ache from it. That is such a wonderful problem to have, and it was such a wonderful evening with Joshua. I know love grows over time, but falling in love too? Evidently yes, because I definitely fell a little bit more in love last night.